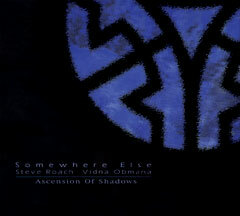 First released as a limited edition of 2000 in 1999, the 3-CD box set Ascension of Shadows quickly sold out, and has remained a highly-desired prize for Roach and Obmana fans. In response to consistent requests, Projekt has reissued the first disc in the series, the long-form piece “Somewhere Else.” This track is without doubt among the most serene & purely atmospheric of Roach and Obmana’s recorded work together. The Ascension of Shadows 3-CD box set was subtitled “Meditations For the Millennium;” the intentions for creating a place of solace for what the artists were sensing, with the approaching anticipation of the year 2000 and beyond, feels especially potent and nourishing when heard today.